Ballenger, a 47-year-old director of a sign language interpreting agency, said President Donald Trump’s victory in 2016 motivated her to actively campaign for McCaskill. “We need to show our friends and neighbors that we are showing up for her,” she said. McCaskill will need all the help she can get in her race against Republican Josh Hawley, the state attorney general, which is expected to be close. Missouri is a must-hold for Democrats if they have any chance of taking control of the Senate this year. Inside Elections with Nathan L. Gonzales rates the race a Toss-up. Turning out the base isn’t just key for McCaskill. On the same day as the Lee’s Summit event, GOP volunteers fanned out across the state to canvass for Hawley and remind voters there was a Supreme Court seat on the line. Republicans are eager to avoid a repeat of six years ago, when controversial comments on abortion from their nominee Todd Akin helped sink his campaign against McCaskill. Hawley, who is less than two years into his current term as attorney general, has made the high court vacancy a centerpiece of his campaign — a potentially effective strategy in a state that has fast shifted right in recent years. Trump carried Missouri by 19 points in 2016, and McCaskill is one of only two Democrats left in statewide office. That also means she has a trickier tightrope to walk than Hawley. McCaskill needs the support of Trump voters but also can’t afford to alienate her Democratic base. That balancing act for McCaskill is encapsulated in the upcoming Supreme Court confirmation. The senator is undecided on Trump’s high court nominee Brett Kavanaugh, whose confirmation hearings begin Tuesday. But she voted against Trump’s last pick, Neil Gorsuch. Hawley, a former Supreme Court clerk, has argued McCaskill does not reflect the majority of Missourians’ values in rejecting Trump’s nominee. But she has voted with Trump on other issues, according to a CQ Vote Watch analysis. Since 2017, McCaskill ranks near the top of the list of Senate Democrats who have voted with Trump. She had the fourth-highest presidential support score among Democrats and has so far backed the president&apos;s priorities 60 percent of the time. McCaskill has acknowledged the upcoming Kavanaugh vote was “not a political winner,” noting she would anger people on both sides no matter what she decides. 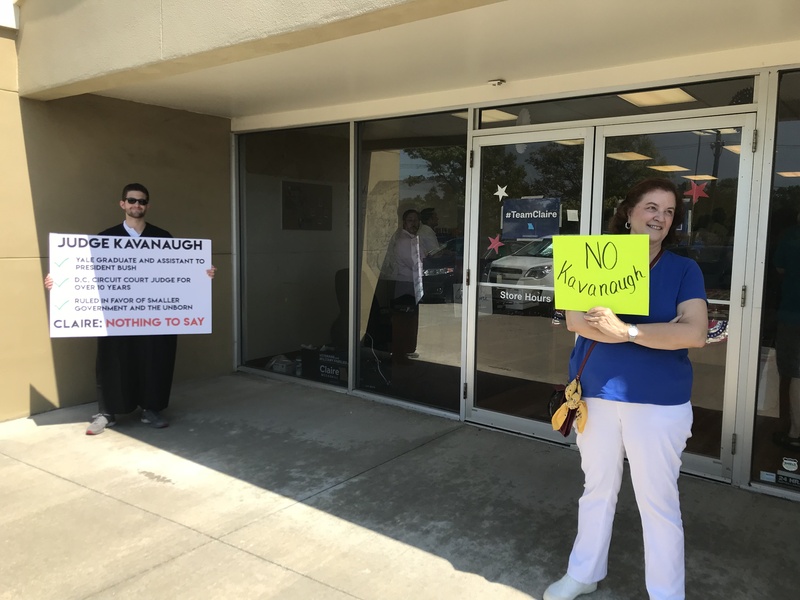 Some Democrats in the office in Lee’s Summit and at a similar event in Springfield said McCaskill’s vote on Kavanaugh wouldn’t affect their support for her. But a ‘yes’ vote could cost her in other ways. Republicans believe the Supreme Court vacancy will help motivate their core voters, who view the high court as critical to limiting abortion rights and protecting the Second Amendment and religious liberty. Sitting in his office in Springfield late last month, Coby Cullins, a Hawley supporter and a member of the Greene County GOP Committee, said he felt like the Supreme Court and the improving economy have been “turning the tide” for the party. “If you had asked me the same question six months ago, I would have said that the Republicans are not as fired up as they need to be to be able to win this election, both in the state of Missouri and countrywide,” he said. 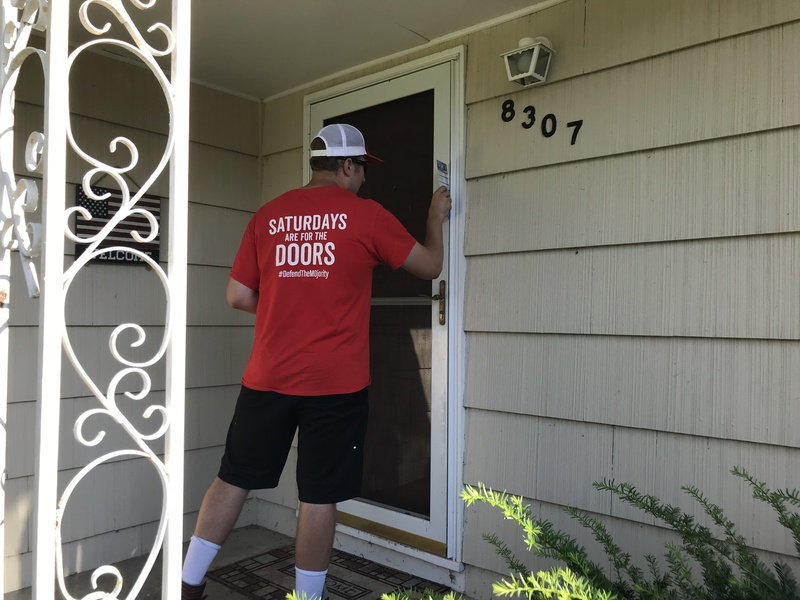 That same Saturday, the Republican National Committee teamed up with the Missouri GOP to send volunteers into neighborhoods across the state, talking to voters about Hawley and the Supreme Court and leaving behind campaign literature. Also that day, volunteers with the Koch brothers-backed Americans for Prosperity hit the streets to talk about the high court. While canvassing a neighborhood outside Kansas City, one party field organizer in a red “GOP” baseball hat and a Hawley campaign shirt encountered Tim Wright, a 57-year-old electrical worker. Hawley noted that the high court could affect abortion rights while addressing volunteers in Columbia that day. “Boy, this is the biggest opportunity of any of our lifetimes, any of us here in the room,” he said, according to video of his remarks posted on Facebook. “We have never had a conservative majority on the United States Supreme Court. And we can get one this year. How about that?” he added, drawing applause. The question for Hawley is whether Republicans will still be fired up once Kavanaugh is confirmed, as expected, before the election. While the Supreme Court is dominating much of the discourse in the Missouri race right now, there are other issues the could galvanize the bases. McCaskill has warned that people with pre-existing health conditions would lose their current protections if a lawsuit challenging the 2010 health care law — that Hawley is a part of — succeeds. She frames her campaign as supporting working people in the state, looking to capitalize on the overwhelming rejection of a ballot initiative to make Missouri a so-called right-to-work state. McCaskill could also get some help from a measure on the November ballot to increase the state’s minimum wage to $12 an hour by 2023. A similar minimum wage initiative was also on the ballot in 2006, when she won her first term. High turnout among African-American voters is vital to McCaskill’s re-election efforts. She took some heat from local black leaders at the beginning of the year for ignoring their communities. Since then she has met and spoken with Reps. William Lacy Clay and Emmanuel Cleaver II, and other African-American leaders in the state, including former state Rep. Don Calloway, who said she had re-engaged with the community. “It’ll never be where the vocal activist crew want her engagement to be, but she is certainly not ignoring the African-American community throughout the state,” he said. He also often talks in interviews and speeches about a “way of life” that is at risk. For her part, McCaskill is not concerned about dampening Democratic enthusiasm as she tries to appeal to more conservative voters, pointing to big jumps in the number of campaign volunteers and doors knocked from six years ago.